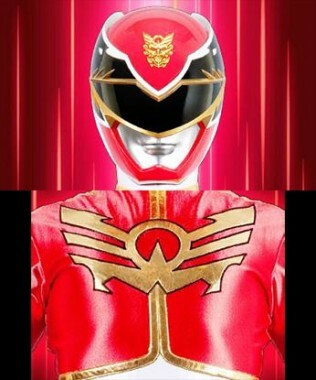 The subject of Power Rangers is somewhat of a special topic for me. From the age of six, I have been following the long-running Sentai hybrid, bearing through all of the cheese to be thoroughly entertained by teenagers fighting in spandex. My fondest memories of the fandom came in the form of the classic Super Nintendo and Sega Genesis beat-em up titles, which were rather solid and have not aged all too terribly. The concept was simple. You got to be the hero, and whatever moved, you beat to death. It was silly, but a ton of fun to a young kid who had only been playing games for a few years at the time. After a ton of cash grabs in the industry since (and yeah, some were decent enough over the years), Saban are back running the show and Namco have delivered a fresh start for the franchise in video game form. 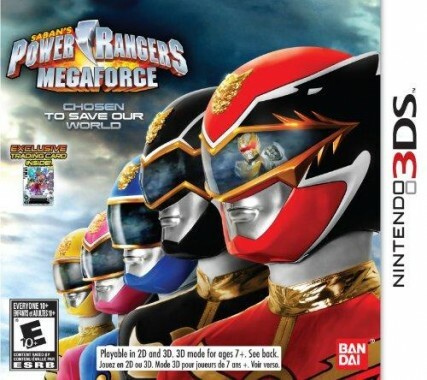 Power Rangers Megaforce takes the latest season of the hit and inserts the player into the experience as they take down the latest evil that is attacking the planet. A photo morphing ability, classic beat-em up gameplay, and original voice acting? It was too good to be true. I wanted to love it from the start, but shortly in, I discovered why licensed games are still a market that fans should approach with caution. Starting off, and as a Rangers fan, I can easily say that Megaforce as its own product is my least favorite of all the Sentai adaptations. This is a series that is trying to recapture the essence of Mighty Morphin’, but failing miserably due to how forced everything is. The allies such as Gosei come off as unimaginative, and the villains – while admirable in design, don’t bring enough depth to the table. Yeah, this is just Power Rangers, but after the “In Space” arc from years ago, I know the potential of the namesake and feel that we as fans deserve to be a bit snobbish to the brand if needed. The game itself carries all of what I mentioned into a generic story about saving the world yet again from takeover, and for the most part, it is told decently with semi-voiced cutscenes. I say decent loosely however as this is just another Megaforce plotline and while this title sticks strongly to its roots, it is still poorly written and those bland, vanilla faces on both sides are still at the forefront of the experience. On the other side of the coin, I also remember back when Mighty Morphin’ Power Rangers: The Movie for the Sega Genesis released, the pasted together story did not even matter as I loved the subject material. This title is honestly handled better by narrative alone, and kids who are into this new team are sure to get that same feeling of excitement as they watch their own heroes battle it out on screen. Battling it out is really what Power Rangers is all about. Megaforce is no different in concept, as the objective of nearly every stage is to get your hands on some beat-em up, side-scrolling action, with plenty of enemies to defeat along the way to each goal. That sounds great, doesn’t it? Well, it would have been – if there weren’t so many poorly executed ideas running parallel to the core experience. 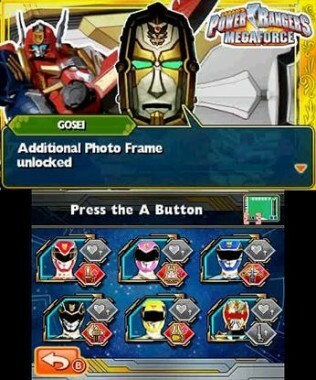 Starting out, the player has to take a photo of themselves to watch that photo morph into a ranger after picking their favorite color. Well, it would look like that, but instead of going the extra mile, it seems the developers preferred to just drop the entire top half of a picture over your own, and we just have to consider that a morph for this gem. Making matters more confusing is the fact that the player can swap between any one of the team by tapping on the screen, meaning that first choice has now been rendered rather pointless. I know I am already sounding negative, but there are so many bad ideas within Megaforce, it would be hard for even a child to ignore the flaws. I love beat-em up gameplay in any game as it honestly is hard to do wrong. Here however, the combat is clunky at best – despite being easy enough to control, and the AI do nearly nothing to cause damage as they don’t react with enough speed or smarts to seem like a viable threat. We already have five rangers that have their own HP bars as it is, so to say this game is overly easy is putting it lightly. The stage design is also convoluted, as each of the five areas are broken up into six sections and those six sections are basically broken up into various objectives that break the flow of the overall gameplay. One minute, you will be hammering away at foes, while the next area of a level will have the player doing nothing but cheap platforming as they break boxes and environmental objects to find cards. 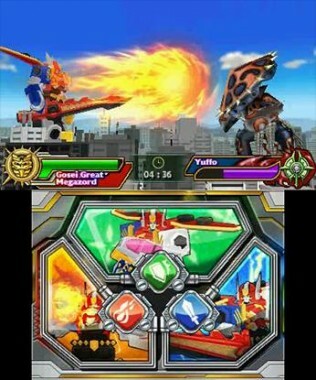 Again, I know this is Power Rangers and the audience is intended young, but Namco should know that most who play this title are going to be looking for some nostalgia and are smart enough to understand what proper level design is. Those cards I mentioned do have a small purpose as collecting enough will unlock a great, powerful attack to take down a good amount of enemies at once. The attack animation however breaks the illusion however and takes far too long for an attack that can be and in some cases that is required to be utilized multiple times in one level. Zord battles are not much better, as the rock-paper-scissors gameplay comes across as boring, and even the extremely hyper voices (which we will get to in a moment) can not liven up what should be much greater experiences. If I enjoyed one element however of Megaforce, it would be the bonus content. Players can scan cards (one is included within the box) to unlock bonus content, such as slideshows and templates to take photos in. This sounds simple enough, but seeing nearly every generation of rangers and being able to line up for a photo with an actually morpher is indeed nifty, but not quite enough to warrant a purchase. There isn’t a ton to say about the visuals. They do their job and everything certainly seems fitting. The monsters also are designed well in the small cutscenes, so compared to Super Legends, there is a lot more eye candy at large if you’re one of those fans who are looking for further detail. Environments are bit more rough, featuring dimly lit areas that fall flat to engross the player, and all look about a generation or two behind the times. When you have a decently rendered model running across the screen in what appears to be a backdrop for a Super Nintendo title, things just feel out of placed and rushed. I also had a few boss run-ins where the game would start to stutter, which is odd considering that the 3DS is far more powerful than this one game. I remember when I thought voice acting was great in video games. It truly adds a bit of life to each title, even if it is done wrong. We do have the cast adding their voices, which I guess is a plus. The gigantic sized minus is that they never shut up. Phrases like “I HEAR BIRDS” and “BREAK THAT BOX!” are just two of many lines you will hear shouted from the team as you make your way through, and this dialogue is repeated so much that it is almost impossible to hear anything else. Sure, it would be fine, even if these lines were repeated in moderation, but the idea that someone looped these clips that much is mind-boggling as it rips the entire concept of even having audio in two, making the player shut that volume off as they play or be harassed about boxes and cards throughout each stage. 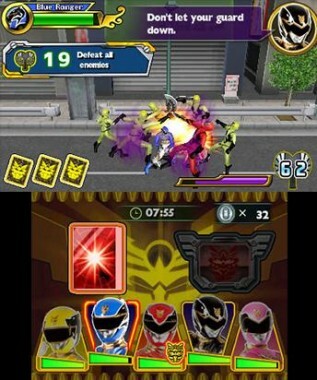 Power Rangers Megaforce is a terrible game. There is no getting around it. The audio is atrocious and the gameplay mechanics are too convoluted to enjoy in the short, messy level design provided. I love the Power Rangers as much as the next fan, but if the extras are the only shining beacon within the entire game, it is a broken game and simply needs to be avoided. 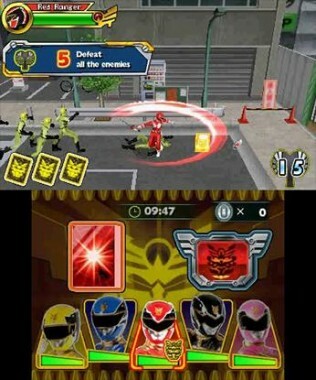 It is a rare thing to see a Power Rangers title released on a portable anymore, but if you have to get your fix, wait for something better or stick to Super Legends, as this 20th Anniversary has brought us one of the worst 3DS games available and a sad, shallow entry into what could of been a pixelated celebration of power.